Introduction. Refereeing. Keynote Address. Some fundamental differences in the adhesion and friction of rough versus smooth surfaces (J. Israelachvili et al.). Keynote Papers I. An overview of current tribology problems in magnetic disk recording technology (F.E. Talke). Surface roughness in elastohydrodynamically lubricated contacts (C.H. Venner et al.). Applications of the micro-scale abrasion test for coatings and bulk materials (I.M. Hutchings). Elastohydrodynamic Lubrication I - Theoretical. The contact of rough surfaces carrying pressure sensitive boundary layers (K.A. Blencoe, J.A. Williams). Elastohydrodynamically lubricated line contact based on the Navier-Stokes equations (C.T. Schäfer et al.). Traction in EHL elliptical contacts with spin conditions (P. Ehret et al.). A deterministic EHL model for point contacts in mixed lubrication regime (A.C. Redlich et al.). An in-depth investigation of the multigrid approach to steady and transient EHL problems (C.E. Goodyer et al.). Computer Heads, Magnetic Information Storage and Retrieval Systems I. Effect of adhesion on wear by plastic ratchetting (F.J. Franklin, A. Kapoor). Triboemission and tribology: an application to magnetic recording area (B. Bou-Said et al.). A new approach for characterising the roughness effects in compressible fluid contact (M. Jai et al.). Coatings and Surface Modification. Surface fatigue resistance of tool steel coated with thin brittle PVD layers (A.J. Huis in't Veld et al.). Manganese phosphating of gears and surface roughness consequence (H.J. Westberg et al.). Mechanical response of coated implant alloys (K.L. Dahm, P.A. Dearnley). Rebound hardness of electroplated coatings (K. Matsuda and M. Kaneta). Corrosion-wear mechanisms of 316L austenitic stainless steel with magnetron sputtered S-phase and CrN coatings (G. Aldrich-Smith, P.A. Dearnley). Keynote Papers II. Macro- and microtribology of magnetic storage devices (B. Bhushan). Tribology of replacement hip joints (A. Unsworth et al.). Nanofriction of LB Deposited Phospholipid Films (H.B. Darowska et al.). Thin Films and Design of Lubricated Components. The role of tribology in the design of machine elements (B.J. Hamrock et al.). Transient thermal effects in a pivoted pad thrust bearing (S.B. Glavatskikh). Friction torque of cylindrical roller thrust bearings in bingham fluid - comparison of the calculated results with experimental ones (T. Hatazawa et al.). Notched rotor face effects on thermohydrodynamic lubrication in mechanical face seal (J.C. Danos et al.). Spring-supported thrust bearings used in hydroelectric generators: limit of hydrodynamic lubrication (A.L. Brown et al.). Computer Heads, Magnetic Information Storage and Retrieval Systems II. Atomic-level carbon thin film as the lubricant layer on Si (F. Honda et al.). High shear rate response of thin lubricant films in a slider-disk interface (J.L. Streator et al.). Study of magnetized sliding contact nickel/stainless steel (H. Zaïdi et al.). Bio-Tribology. Adhesion between bone cement and hip prosthesis (F.J. Marley, W. Scott). Tribological behaviour of artificial cartilage in thin film lubrication (T. Murakami et al.). Elastohydrodynamic lubrication analysis of UHMWPE hip joint replacements (D. Jalali-Vahid et al.). The effect of radial clearance on lubrication in a metal-on-metal joint tested in a hip joint simulator (C. M. McNie, D. Dowson). Worn surface characteristics of ultra-high molecular weight polyethylene lubricated with bovine serum (Y. Sawae et al.). Keynote Papers III. Molecular scale liquid lubricating films (H.A. Spikes, M. Ratoi). Thinning films and design of lubricated components - a state-of-the-art report from Japan (Y. Kimura et al.). Engine Tribology I. Fatigue phenomenon of engine bearings with misaligned journal (A. Ono, K. Hayashi). 3D EHD lubrication optimised design of a four cylinder in line automotive engine crankshaft (D. Bonneau et al.). Interactions leading to formation of low friction films in systems containing molybdenum dialkyldithiocarbamate and zinc dialkyldithiophosphate additives (S. Korcek et al.). Factors influencing boundary friction and wear of piston rings (M. Priest). Lubricant Rheology I. Influence of refrigerant on viscosity and pressure-viscosity coefficient of refrigeration compressor lubricants (R. Tuomas and U. Jonsson). Influence of grease composition on its structure and its rheological behaviour (I. Couronne et al.). The pressure-viscosity coefficient at hertz pressure and its relation to concentrated contact traction (S. Bair, W.O. Winer). Metal Forming. Surface indentation test (SIT) for sheet metal (H. Wihlborg et al.). A mixed film lubrication model for strip rolling and its correlation with experiment (A.K. Tieu et al.). An experimental determination of friction in cold rolling (A.K. Tieu et al.). High speed photographic study of the tool-chip interface in machining (B. Ackroyd et al.). Keynote Papers IV. The importance and measurement of lubricant rheology (K. Walters). Elastohydrodynamic Lubrication II - Experimental. Film thickness and pressure in micro-EHD contacts (A.V. Olver et al.). Temperature and shear stress in thin film EHD contacts (R.S.A. Grieve, H.A. Spikes). Friction and Wear I. Tribological characteristics of duplex treated AISI 4140 steel (B. Podgornik et al.). Effects of the tribological interface properties on the contact temperature calculation (M. Kalin, J. Vi Intin). Effect of in-situ electroplating on friction (K. Hiratsuka). Physical & Chemical Actions Associated With Surface Films/Boundary Lubrication I. Tribo-oxidative degradation of polished polycrystalline diamond films in 0.2 torr partial pressure of oxygen (M.N. Gardos). Boundary lubrication properties of diamond and surface-modified diamond films with various water solutions (S. Miyake). The surface chemistry of chlorinated and sulfurized extreme-pressure lubricant additives (J. Lara et al.). Lubricant Rheology II. Shear-degradation of grease and base oil availability in starved EHL lubrication (J.-S. Mérieux et al.). Determination of lubricant compressibility in EHL conjunctions using the hybrid technique (A. Jolkin, R. Larsson). Elastohydrodynamic Lubrication III - Experimental. Formation of dimples in elliptical EHL contacts (M. Kaneta, N. Nishikawa). Study of elastohydrodynamic contacts with fluorescence microscope (J. Sugimura et al.). Shear behaviour of EHL film on practical traction test (F. Itoigawa et al.). Friction and Wear II. An investigation of sliding metallic wear in the presence of thin film boundary lubrication (E.M. Kopalinsky, P.L.B. Oxley). Wear: influence of detached particles trapped in the contact when a hard cylindrical asperity slides over a soft smooth surface (M. Busquet et al.). Physical & Chemical Actions Associated With Surface Films/Boundary Lubrication II. Key governing factors for the tribochemical changes in the interface films (M. Kalin, J. Vi Intin). In-situ generated tribo-film in sliding of aluminium alloys against steel (K. Shivananda et al.). Engine Tribology II. Preliminary study of the influence of piston secondary motion on piston ring tribology (R.J. Gamble et al.). Very Thin Film (Nanometre) Lubrication. Thin film lubrication study by colorimetric interferometry (M. Hartl et al.). Study on synthesis, preparation of LB dflm and tribological properties of PS-PEO and PEOX (B. Shi et al.). Multi channel interferometry for measurement of the thickness of very thin EHL lubricant films (J. Lord et al.). Behaviour of colloidally-dispersed solid particles in very thin film lubricated contacts (F. Chiñas-Castillo, H.A. Spikes). Rough Surfaces. An experimental study of the relationship between surface roughness and stress in EHL contacts (C.J. Hooke, K.Y. Li). Scale-invariant analysis of tribological surfaces (P. Podsiadlo, G.W. Stachowiak). Friction in boundary and mixed lubricated line contacts with different roughness (R. Bassani, E. Ciulli). Lubricants and Lubrication. The effect of HFC refrigerant dissolution on oil film thickness and wear characteristics of oils (Y. Yamamoto et al.). Lubricant supply by porous reservoirs in space mechanisms (M. Marchetti et al.). This collection of fully peer-reviewed papers were presented at the 26th Leeds-Lyon Tribology Symposium which was held in Leeds, UK, 14-17 September, 1999. The Leeds-Lyon Symposia on Tribology were launched in 1974, and the large number of references to original work published in the Proceedings over many years confirms the quality of the published papers. It also indicates that the volumes have served their purpose and become a recognised feature of the tribological literature. 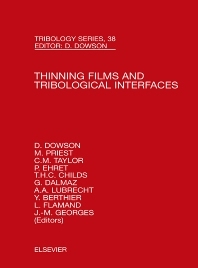 This year's title is 'Thinning Films and Tribological Interfaces', and the papers cover practical applications of tribological solutions in a wide range of situations. The evolution of a full peer review process has been evident for a number of years. An important feature of the Leeds-Lyon Symposia is the presentation of current research findings. This remains an essential feature of the meetings, but for the 26th Symposium authors were invited to submit their papers for review a few weeks in advance of the Symposium. This provided an opportunity to discuss recommendations for modifications with the authors. For engineers, technicians, students and researchers working in the field of tribology and its applications.